Hi readers, how’s your weekend coming along. I’m trying my hardest not to think of work on this cold Sunday evening in the East end of London. When I do finally get to work tomorrow however, I know a few things to tap into whenever I need to smile while working away. I am talking about a 5 and 4 course gourmet experience I shared with Vanessa at a Marylebone based restaurant called Ozz. I enjoyed it so much I thought why not do a review. So what did I find out about Ozz?. This small and intimate restaurant has a head chef, Emerson Amelio D’ Olivera who hails from Brazil. 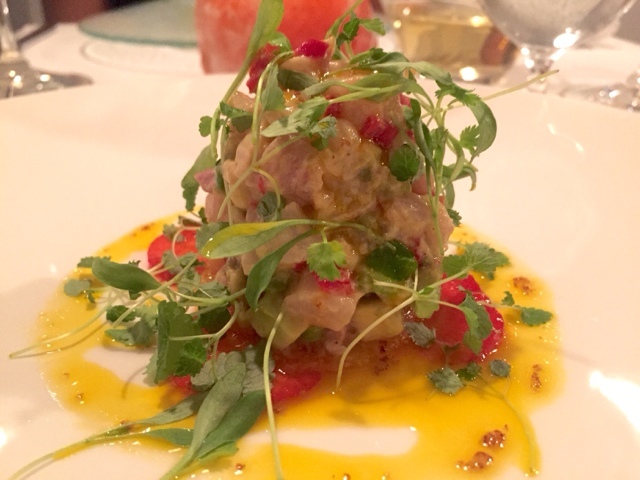 The food seemed to have different influences, however if I was to choose a cuisine, I would say it was probably European with strong French influences.What I loved most about the restaurant was the sheer diversity of flavours and textures I experienced during the meal. Starting from the starters all the way to the desserts, the chef really needs to be complimented. The prices were quite competitive as well, £50 for the four courses and £55 for the five courses, with an optional £25 wine pairing if you so wish. 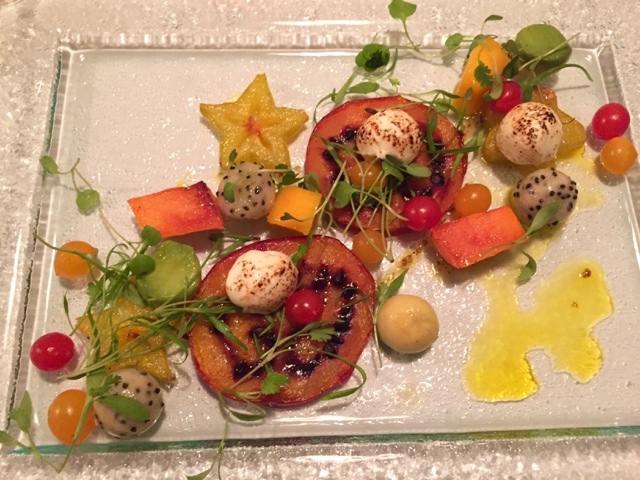 Which comprised of Grilled star fruit, Formosa , dragon-fruit, guava, all seasoned with de de oil, Maldonado sea salt flakes, served with burnt mascarpone. Probably my favourite dish of the night. Gilthead bream in aromatic kalamansi lime, with avocado, Romano pepper and lemon balm, on a Devonshire crab and Brazillian manioc crispy cake,maracujs and dende dressing. A tasty and acidic dish in my opinion. 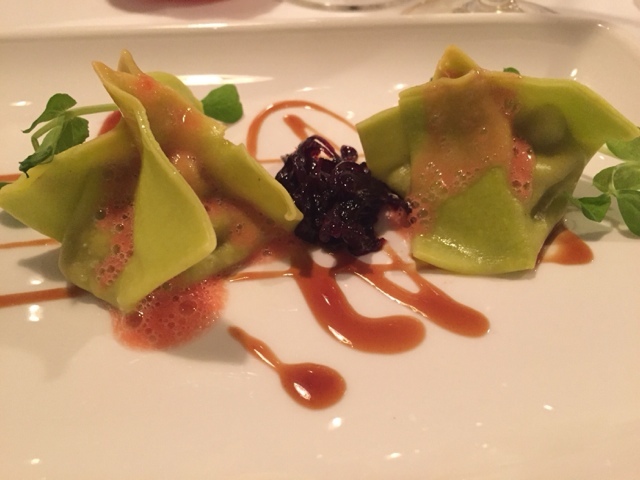 Home made pasta filled with premium foie gras ( from Les Landes, South-west of France) and hazelnut, with chestnuts rocks, guava froth, duck jus and braised shallotte. The foie gras filling and duck jus were the stars of this dish. The shallotte also complimented the dish quite well. 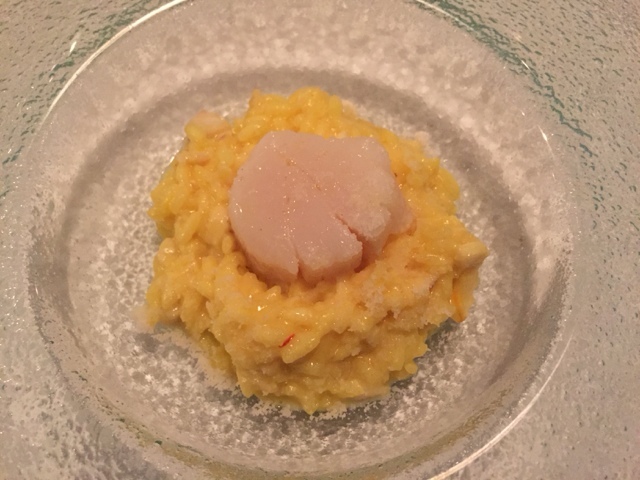 Hand-dived scallop from Orkney lochs served on a risotto of halibut and Sea bream. I couldn’t resist finishing all that risotto. 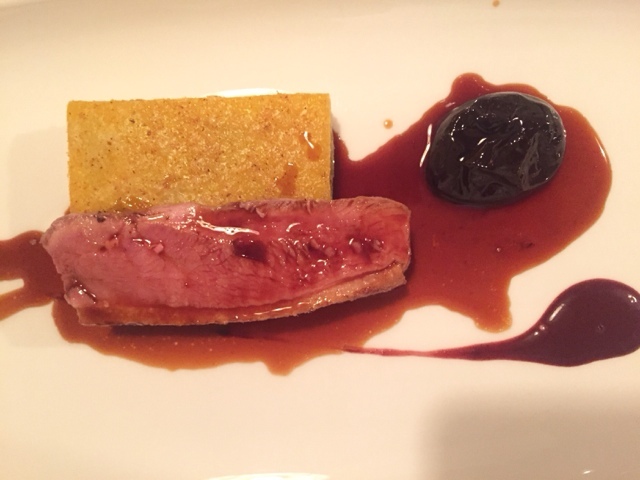 Duck from the Creedy Carver farm (Devon) served with cassava crust with pistachio and Brazil nut, brandy duck sauce with prune and purée of acai. The rare duck and brandy duck sauce were definitely the stars of the dish. The prune went well with the duck as well. 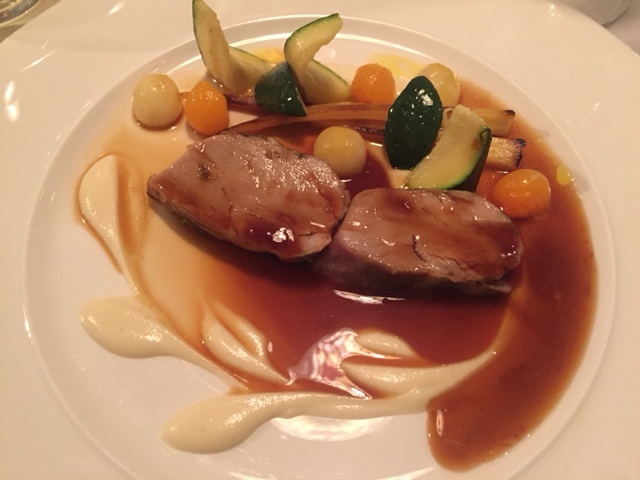 Bred at La Chapelle Glain by Boussin, the veal was served with freshly smoked English legumes and celeriac purée merlot and duck jus. The very soft veal melt in the mouth veal and celeriac purée made this one of the nights highlights. 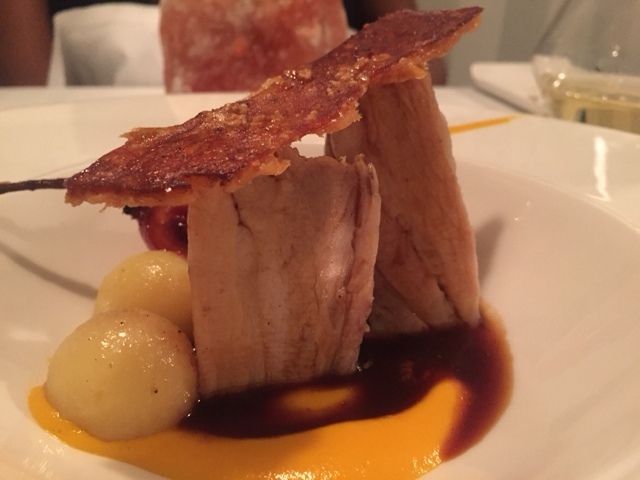 Five spiced belly of pork served with poached tamarillo and carrot d’anise purée. I loved the presentation of this dish. 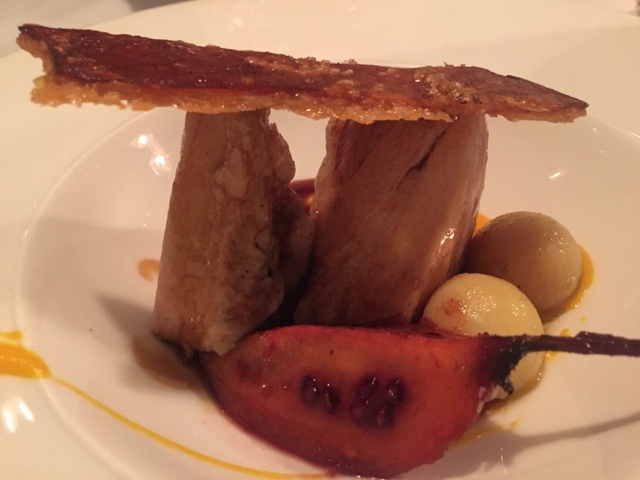 The poached tamarillo and soft pork were quite impressive. I hope you guys don’t mind my two pictures. This dessert comprised of a Yuzu mousse. 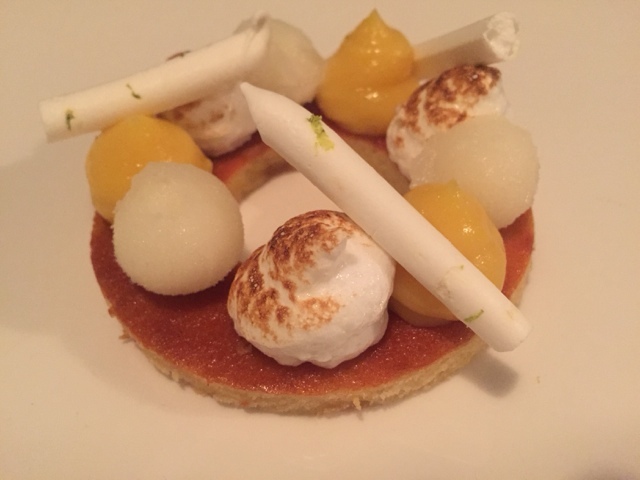 orange supreme, lemon cream, citrus zest and sorbet. 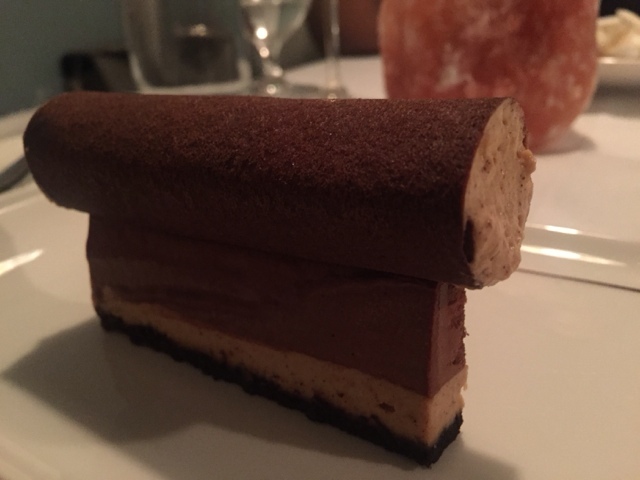 My dining partner said that this was one of the best desserts she’s ever had. Not a surprise, seeing as she’s a massive fan of all things Lemon. I had a taste and it was quite tart. 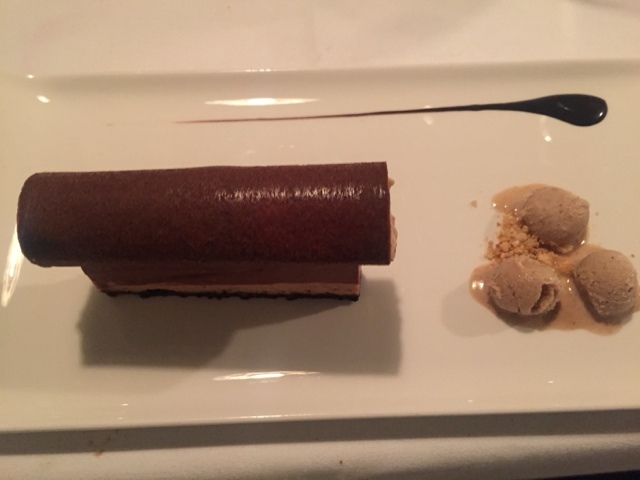 Delicious Chocolate mousse, Hazlenut cremeaux, hazelnut mousse and Hazlenut ice cream. Overall, the quality of all dishes were top notch, matched with exemplary customer service. I really enjoyed this restaurant and can’t recommend it enough. 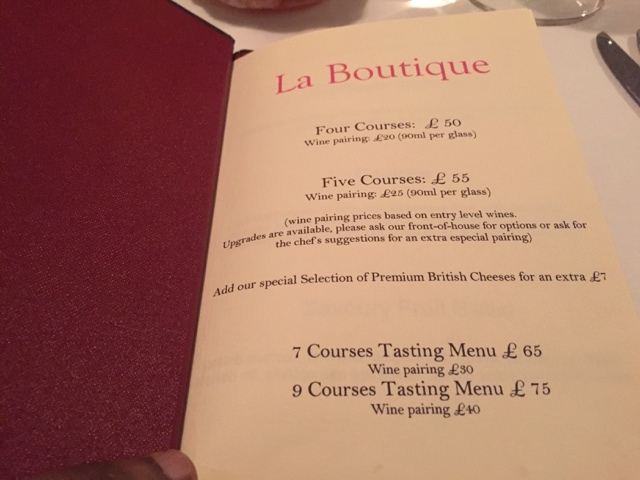 No wonder it made Tripadvisors best French restaurants in London, 2015. I’m off to Majorca in a few days so expect another post next week.